Before we get into the putative death of on-premise ERP (and its slayer, the mighty cloud), let’s bear in mind that over the course of decades now, the ‘paperless office’ has been just around the corner. The mainframe, we first heard, was dead somewhere in the early 2000s. And even ERP software itself, whether on-prem or not, we have been told as far back as two decades ago, is, you guessed it, dead. Slightly more recently, an amended version of the death of ERP suggested that ‘the big ERP approach’ had met its end. Except, none of these prognostications have come to bear. Paper is as useful today as it was when papyrus was all the rage, mainframes still chug away dutifully in data centres all over the world (and you can still buy a shiny new IBM zEnterprise), and despite serious market consolidation, there are multiple choices for ERP software today – on-prem and cloud – , as shown in the iStart ERP Buyer’s Guide. So, who is saying that on-premise ERP is dead? None other than Panorama Consulting, a US outfit which provides useful insights on the market, including its Clash of the Titans report and its comparative assessments of the vendor landscape. 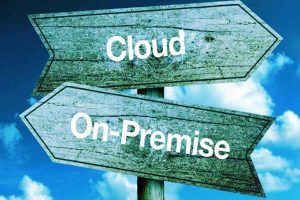 In a blog that caught our attention, Panorama made the baldly stated claim ‘Cloud ERP Software or Bust: Five Reasons Why On-Premise is Dead’. Predictably, those five reasons are all the usual justifications for almost any cloud software: opex vs capex, anywhere-accessibility, focus-on-core-business, better security. Well, that’s three of the usual suspects; the final two are a little more intriguing. Forcing change, and ‘truly transforming’ your IT organisation. Now here’s the thing where it gets a little more complicated. Panorama’s own research (page 12) shows that the majority of implementations are on-premise at 56 percent (2016), with 27 percent cloud and 17 percent hosted. There is substantial year-on-year growth in cloud, however, as between 2015 and 2016 it went from 11 to that 27 percent. So, is cloud steamrollering on-premise locally? Again, the answer isn’t cut and dried. There are a number of factors which will point a business to making the choice and at least some of that is down to scale and legacy approaches to IT. Chad Gates, MD of Australian vendor Pronto Software, said that while on-prem isn’t dead, it is dying a slow and progressive death (much like those IBM mainframes, one imagines). “If you’re talking to first time ERP customers, then the vast majority are going straight into the cloud or hosting. The same goes for those who are scaling up. Our stats show that 75 to 80 percent of those go with this option,” he explained. For some, that’s as simple a matter as making use of what’s already there. “Clients will say ‘of course we want on-premise as we have invested in IT infrastructure’”. That strongly supports Mulcahy’s view that where ‘serious’ complexity and heavy lifting are required, on-prem is still the boss. “Is on-prem dead? Well, not yet. It’s up to the market to decide, if there is still market for it, we will provide it,” Luey added. However, there are further concerns which don’t relate directly to software structure, if it could be called that. “Issues like data sovereignty come into play a bit, especially for government institutions which are mandated to have it in country. Then there are contractual issues around jurisdiction for suing if things go wrong. And there can even be a bit of paranoia around, for example, the USA’s National Security Agency looking at data – although that tends to be more of a theoretical issue than a practical one,” Gates explained. Pronto’s own numbers show that there is rapid growth in the cloud, with ‘around 25 to 30 percent’ of its clients opting for this configuration. “That’s driven not only by the ERP solution, but also a trend towards managed services to get rid of the overheads of self-run systems for all sorts of other infrastructure,” Gates said. That, of course, leaves the greater number of its clients still well and truly on-prem. The trend may be towards the cloud – and it would be, particularly as small businesses ‘born in the cloud’ become bigger ones and follow a natural progression. But like the elusive paperless office, we’re going to pick that on-premise ERP will prove a resilient beast for years to come.